- Reduction of fixed costs by low building occupancy expenses in comparison with other procedures. The aluminium tape is deformed to a pipe by means of a rolling set. The die head is inserted into the aluminium pipe before the welding point and extrudes the adhesive layer and the pipe inner wall after the welding point. 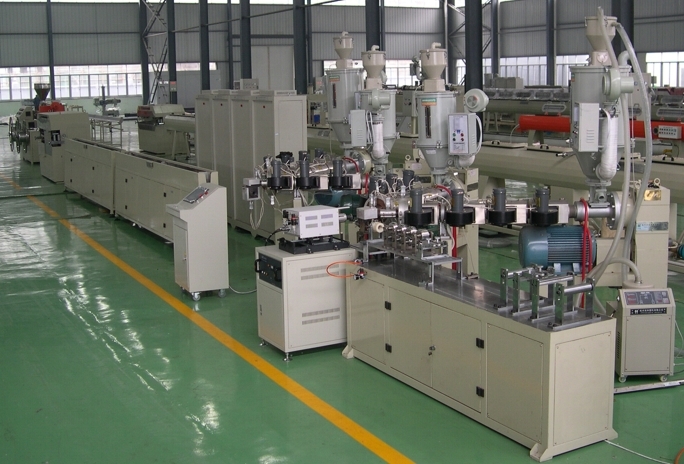 Besides, adhesive and outer layer are superimposed on the aluminium pipe via an angle extrusion head. The finished pipe is led into the cooling spray bath and passes afterwards through all further stations of finishing. we offer in this regard components for the measuring of outer diameters, the marking of pipes, haul-offs and coilers. All functions can be operated and co-ordinated via a central control unit.